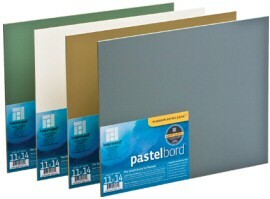 Pastelbord is a clay and gesso coated hardboard panel with a granular marble dust finish comparable to a sanded pastel paper except more durable and more versatile. All traditional pastel techniques can be completed on the board with the surface allowing for many layers to be used. Pastelboard is excellent for plein air painting and travelling as well as in the studio. Of note is the mixed media capabilities of the boards. You can also use watercolours, inks and acrylics on the board. The board will not buckle, twist or tear with even extensive wet media use.